A Day to Remember – every week! 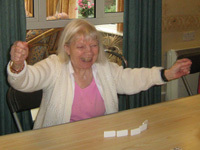 We are committed to providing a day service which will enable and support people to socialise, to learn new skills, to become more active and to live healthier, more independent lives. In doing so, we are discreetly monitoring the health and welfare of particularly vulnerable people. But overall, we are committed to providing a service that is full of fun and laughter and that makes a very real difference to people’s lives. and help us provide day care services. As well as contributing to a worthwhile cause, volunteering with us is a great way to develop your skills, meet new people and work as part of a team. …is a locally managed independent charity serving the people of the borough since 1971.